Valencia 0-2 FC Barcelona (0-3 on aggregate): Cup finalists once again! Does this team ever stop breaking records? It would seem not and February 8 produced yet another memorable night for the all-conquering blaugrana. FC Barcelona have become the first team to ever reach five Spanish Cup finals in a row, where they’ll have the chance to make it four titles in a row when they meet Sevilla on April 21 at a venue to be decided. The odds were already stacked in their favour after winning the first leg 1-0. And although Valencia put up a fine fight in the first half, Philippe Coutinho’s goal just after the break pretty much settled things before Ivan Rakitic brushed away any remaining shadows of doubt with an 82nd minute clincher. From the word go, this game had a very different dynamic to the first leg. At the Camp Nou there was always the knowledge that things wouldn’t really be decided until seven days later. Tonight there were not going to be any second chances. Both goalkeepers had plenty to do in the first 45 minutes, with Jaume Domènech’s dive to deny Leo Messi the most spectacular intervention. Barça’s Argentinian superstar was creating danger every time the ball came near his feet. But it was Valencia who came closest to a first half goal when when Rodrigo sent a header clattering onto the bar. 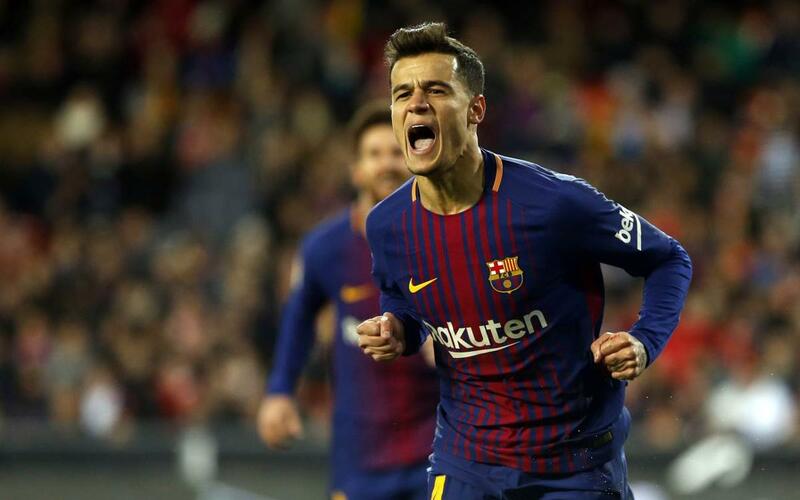 Coutinho replaced Andre Gomes after the break, and after just five minutes on the field, the Brazilian was celebrating his first goal for his new club. Luis Suárez made it, with a terrific run down the left, leaving Ezequiel Garay in his wake as he set up Coutinho with a splendid assist. The away goal meant Barça already had a foot and a half in the final. Valencia has less than 40 minutes in which to score three. It looked like they’d got at least one when José Luis Gayà fired from point-blank range, but Jasper Cillessen pulled off a staggering save. The sell-out crowd at Mestalla was praying for a miracle by this stage, and with ten minutes to go Rakitic put them out their misery by firing home the goal that clinched it – with Suárez once again doing the hard work in the build-up. That really was game over, and the ideal time for Ernesto Valverde to send out new Colombian signing Yerry Mina for his first playing experience at his new club. By this stage, large numbers of home supporters were already leaving the ground. Valencia's cup journey was over. Barça had already sealed qualification, and nobody could argue that that wasn't precisely what they deserved. So bring on the final! Bring on Sevilla! And Força Barça!